Welcome to Jan Gray Piano Art Studio, Macon, Georgia! Piano and keyboard lessons for pre-schoolers, elementary students, teens and adults. Classical piano, improvisation, composing, jazz, comtemporary praise and worship, pop, rock and other genres. Students learn the practical application of music theory at the keyboard. Come join the fun! I love teaching piano and sharing my love of music with my students! It’s been a busy year as the studio has grown and I’ve sought to provide the best for my students. Relationships with a diverse group of piano teachers around the world has enabled me to expand my own joy and knowledge of teaching students of various ages and musical preference. For every hour I spend teaching, I spend at least 2-3 hours writing my own music and teaching materials, researching the best and latest from other teachers, organizing new music and games and making lesson plans. My First Piano Adventures, and Piano Scales Make Piano Magic and additional information regarding pre-school piano and composing: Lessons, ages 3-5. I have searched for many years for a series that teaches beginning to intermediate jazz improvisation and does it well. Bradley Sowash has produced a series that meets this need and does it beautifully. 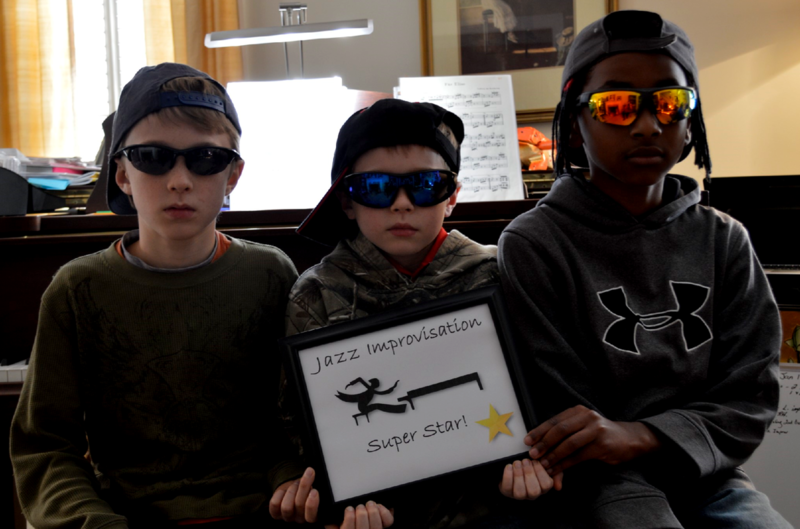 It is one thing for a student to be able to play jazz but quite something else for that same student to know what works and why so that they can compose or improvise their own jazz music. ​Bradley Sowash has performed throughout the US and Europe and is also an amazing educator. He has recently published nine books for students who wish to study jazz and contemporary piano. Much of today's contemporary praise and worship music as well as contemporary piano in general has its origin in jazz. Visit the video page: Masterclass Sept 2015 to get a taste of this amazing series. Masterclass is great preparation for performing and students love the community of young musicians they meet in master class. Depending on the age and skill of students, I try to schedule 2-4 opportunities for Masterclass each year. The class is held on a Saturday afternoon and lasts for two hours. I recently surveyed students after the April 2016 class and most requested that we meet once a month! . Performing their very own original compositions. Sharing their favorite lesson assignments. study that meets each student's needs and interests. I have students who are in accelerated programs at school and I also have experience with students with ADD, ADHD, Autism Spectrum Disorder and other special learning challenges. I customize a plan for each student..
*Guest WiFi for waiting parents. *Swing set for siblings who are waiting with parents. * Students may choose from four different pianos in my studio: I teach on a Yamaha Grand Piano and I also have 2 Yamaha Digital Grand Pianos and a Yamaha P 105 Digital Piano. This allows for siblings, Music Buddies, Parent /Child Lessons to be partially shared and makes the best use of lesson and practice time. Music for Boys ... Super Heroes! , The Adventures of Fearless Fortissimo, Piano Books for Boys, Read the Comic, Play the Music. I loved it so much, I immediately purchased My Piano Teacher Thinks She's a Ninja. This is not the music I was forced to endure as a beginning piano student. Piano Buddies: When two or more students are close in age and skill, I like to schedule lessons back to back so there is potential to share part of a lesson. This"dyad" approach gives students the advantage of a longer lesson at no extra cost. Students enjoy duets, music games that reinforce learning and improvisation and composition assignments that are mutally beneficial. See slideshow pictures of games below. My fastest progressing students have the benefit of individual instruction and a small group lesson. This approach is great with siblings. I am able to teach up to five siblings at a time even though they may differ in age and skill. Through the use of technology, I've developed learning centers at three digital pianos with headsets, an ear training and music theory lab, and a classical music history and listening lab. Students are able to enjoy classical selections and choose their favorites for future study and performances. Up to four students are able to gain the benefit of additional instruction while the fifth child is having individual instruction with me on the 6' Yamaha Grand. We all remain in the same room and students progress from one station to the next. Those involved in this group approach have the benefit of a longer lesson and excel at an amazing rate and each pays the cost of a 30 minute lesson. It takes a lot of advance preparation on my part but the results are amazing! Using this approach, students as young as age 6, begin to get music theory education, most do not get until they reach the university level; we do much of this using interactive games. I enjoy one family of boys for over 2.5 hours every week and their progress is amazing... and we have fun! Sibling Group PIano Lessons and Piano Buddies are a great way to encourage students to practice who are losing interest. Most children thrive on private time with a teacher but also need a more social environment with their peers. I've found nothing motivates a student more than being able to compose their own music and share it with others and learning the foundational principles of composing makes it much easier to learn their weekly assignments. So very thankful to Bradley Sowash (performer, composer, educator) for his live, interactive online courses for classically trained teachers who wish to enhance their improvisation and jazz skills. My training with him continues to provide my students with many off the bench interactive games that teach university 101 music theory. Students as young as 5 are able to understand and apply these advanced musical concepts in a fun way. We take this knowledge and apply it to their skills at the keyboard. Music theory taught with the practical application at the piano develops well rounded musicians, training their eyes and their ears for playing classically, composing and improvising. Let's Ride the Circle of 5ths.! Once students learn their first scales, the discovery of transposing their music to a new key is a natural progression. They quickly learn that they are able to compose their own songs within the first few months.